Breakfast can easily turn into a carb fest if you enjoy pancakes, French toast, danishes and doughnuts. Even if you reach for fairly healthy choices, such as oatmeal, whole-grain toast and fruit smoothies, you'll take in a substantial number of carb grams. Most low-carb diets limit your total daily carb intake to between 50 and 150 grams, explains a review of research published in a 2007 issue of the American Journal of Clinical Nutrition. This means you can't waste your grams on sugar or refined grains at breakfast. A low-carb, no-sugar breakfast still means you can walk away from the table satisfied and fueled for the day, though. Eggs are a natural no-carb breakfast and contain no sugar, making them a healthy addition to your morning meal. Serve poached eggs over 1/2 cup of sauteed spinach or chopped peppers and mushrooms for, at most, 3 grams of carbs. Top scrambled eggs with sliced avocado, which adds just 1 gram per half of a fruit. Fry eggs with bacon or sausage -- when you skip the toast and hash browns, this classic is a nearly no-carb meal. Keep hard-boiled eggs in the fridge for busy mornings so you can simply grab two and eat alongside a string cheese, with just a trace number of carbs, and an ounce of almonds, with just 6 grams of carbs. Add variety to egg dishes by making them into omelets and frittatas. Fill omelets with with chopped veggies, ham, bacon, mushrooms, herbs and cheese. Most of these fillings have negligible amounts of carbohydrates. Frittatas are similar to omelets but are usually cooked in a cast-iron pan in the oven and look like a crustless quiche. To make a frittata, heat the pan over high heat and melt butter or other cooking oil. Add the eggs, then the fillings and finish cooking in the oven. Tasty, low-carb combinations include zucchini and Parmesan; sausage and mushroom; tomato and kale; or asparagus and goat cheese. If you're worried that consuming so many eggs could be dangerous to your health, don't be. Eggs do contain cholesterol, but dietary cholesterol doesn't contribute to your blood cholesterol levels nor raise your risk of heart disease. A study published in Nutrition Journal in 2010 was one of many that shows daily consumption of eggs had no negative effect on cholesterol levels in adults. 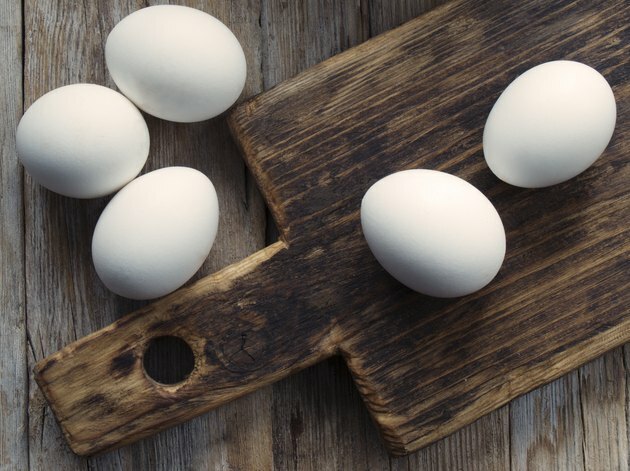 Even if it's healthy to eat eggs daily, you may tire of them on a low-carb diet. A way to avoid carbs and sugar at breakfast is to simply let go of the idea that certain foods are for the morning. Have a piece of roast chicken and steamed broccoli or grilled steak with sauteed mushrooms and green beans. Try a morning plate of salmon broiled with a side of tomatoes and zucchini or a can of drained tuna with sliced avocado. All are extremely low in carbohydrates, with the vegetables adding just 1 to 3 grams of carbs to the proteins, which have no carbs. Make scrambled eggs with goat cheese and chives for a fancy change of pace. Serve poached eggs over grilled slices of tomato or steamed artichoke hearts and top with hollandaise -- a creamy sauce of butter, egg yolks and lemon juice that's traditionally used to top eggs Benedict. A small tomato offers just 2.5 grams of carbs and artichoke hearts about 1 gram each. Lox served on rounds of tomato or cucumber with dollops of sour cream and fresh dill is another low-carb special-occasion breakfast food. Serve a cup of fresh raspberries on the side of any of these meals for a sweet splurge, with 14 grams of carbohydrates. The sugar in the raspberries is all-natural, not added. This makes these berries one of the lowest-carb fruits available. The Kitchn: What's the Difference Between a Frittata and an Omelet?